Heat oven to 450°F. 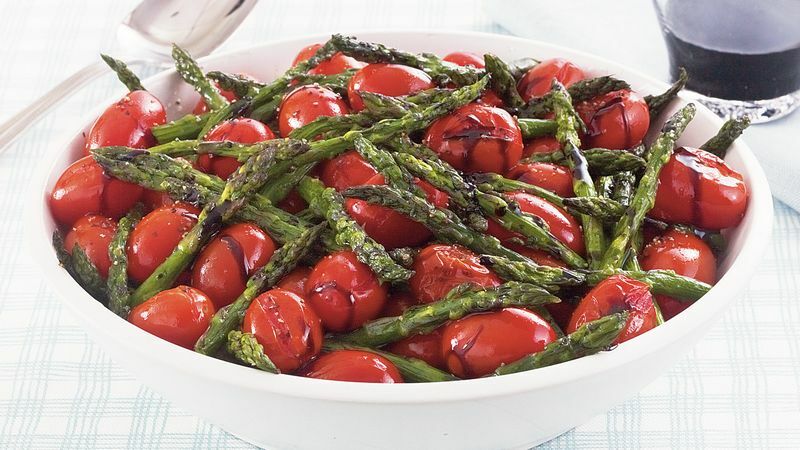 In large bowl, place asparagus and tomatoes. Drizzle with oil; sprinkle with salt and pepper. Toss to coat. Divide mixture evenly between 2 ungreased 17x12-inch half-sheet pans. Roast uncovered 10 to 15 minutes, stirring once, until browned. Transfer vegetable mixture to serving bowl or platter; drizzle with balsamic glaze. Look for balsamic glaze with vinegars at the supermarket. In a pinch, you could substitute balsamic vinegar.